Is' the DeepState/DarkState/or the Shadow Government of the United States, akin to the STASI of the German Democratic Republic? In case you have been educated in the government Indoctrination Centers called the American Public School System then you may have never heard of the STASI or even the content of the rest of the question. If that is true then I will try to bring you up to speed with the Readers Digest version. If you pursue the research on the DeepState you will in fact find it a DarkState and is truly a government behind the government that operates in the shadows. The U.S. Federal Government has become nothing but a puppet on strings, but the question is who is pulling the strings. That my friend is the DarkState. Have you ever wondered why since the end of the Second World War, the powerful United States, the most powerful country in the world, has never won any more wars? The Korean War…we, after 67 years are still fighting that war. Vietnam…we barely escaped with our tails in tacked. And then all the little wars in Africa that we are still fighting that started long before the Middle Eastern wars that are again still going on, and these are wars that we will never win either. So the question was why we haven’t won any of these wars. The Famous ancient Chinese military strategist and war lord Sun Tzu from the 5th century BC said “Never get involved in a war you cannot win.” Could we have won these wars? Well of course we could have, most of them in a couple of days. But the Military Industrial Complex (MIC) which built the DeepState government doesn’t want to win wars anymore, they want Perpetual War. As long as there is war the M I C gets rich. After all, wasn’t it WWII that got us out of the Great Depression of the 1930’s? Actually no. But that is what they want you to believe. The truth is by 1941 the country had all but completely recovered from the planed economic depression created by the International Banking Cartel and Wall Street. Oh! Who is the International Banking Cartel? Well they are the World Central Banking System that runs the Military Industrial Complex. Yeah I know…when are we going to get to STASI??? Soon, real soon. In 2001 there were seven industrial countries left in the world that were not controlled by the World Banking Cartel. Today there are three. Korea, Iran and Cuba. Yes the United States is controlled by the Banking Cartel. It’s called the Federal Reserve Bank. So where am I going with this? Fair enough! You see after peeling away all the vails of secrecy you will find that the International Central Banking Cartel controls the Military Industrial Complex and the MIC controls the DeepState. And the DeepState controls the U.S. Federal Government. And the Federal Government controls the People. No’, there is nothing in the U.S. Constitution that says that this was the plan of the Framers. But then nether was Democracy. America was designed to be a Constitutional Representative Free Republic, governed by the people themselves. Not a Democracy. So what does all this have to do with STASI? Well, remember at the beginning I mentioned the NATIONAL SECURITY STATE? No it’s not another kind of a State. As I said it is a hybrid of Corporate America…it’s the DeepState, which is going out of control. Have you noticed that everything today is done in the name of National Security? This is why I asked the question at the very beginning… Is the DeepState/DarkState/or the Shadow Government of the United States, akin to the STASI of the German Democratic Republic? 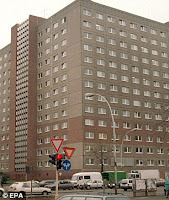 STASI was the East Germany security agency. Most of us know something about WWII in Europe against Nazi Germany. But do you know what happened in Germany after the war? You may even remember that Russia took control of part of Germany which included half of the Capital City of Berlin. This resulted in West and East Germany. Now this was not quite the same as North and South Carolina. East Germany was controlled by Communist Russia and West Germany became a European Parliamentary Democracy. In 1945 East Germany became the German Democratic Republic (GDR), it was the smaller part of Germany, approximately 1/3rd which became the Marxist-Leninist socialist republic with its leadership dominated by the Soviet-aligned Socialist Unity Party of Germany (SED) in order to retain it within the Soviet sphere of influence. That lasted until 1990 when the Soviet Union collapsed. The Much feared STASI was the Security agency that governed East Germany for 40 of the 45 years. State Security Service (Staatssicherheitsdienst, SSD), commonly known as the Stasi was the official state security service of the German Democratic Republic (GDR of East Germany). It has been described as one of the most effective and repressive intelligence and secret police agencies to have ever existed in the world to date. 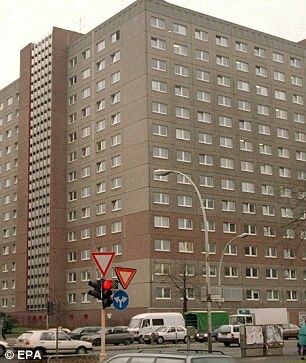 The Stasi was headquartered in East Berlin, with an extensive complex in Berlin-Lichtenberg and several smaller facilities throughout the city. 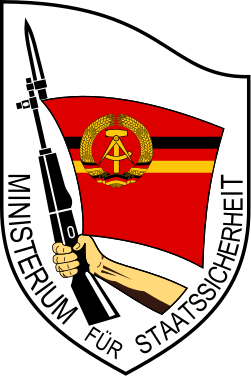 The Stasi motto was "Schild und Schwert der Partei" (Shield and Sword of the Party), referring to the ruling Socialist Unity Party of Germany (it was the German: Sozialistische Einheitspartei Deutschlands, SED). Erich Mielke was its longest-serving chief of the STASI, in power for thirty-two of the forty years of existence. One of its main tasks was spying on and controlling the population, mainly through a vast network of citizens turned informants, and fighting any opposition by overt and covert measures, including hidden psychological and physical destruction of dissidents (Zersetzung, literally meaning decomposition). It’s Main Directorate for Reconnaissance (German: Hauptverwaltung Aufklärung) was responsible for both espionage and for conducting covert operations in foreign countries. Under its long-time head Markus Wolf, this directorate gained a reputation as one of the most effective and feared intelligence agencies of the Cold War. The Stasi was one of the most hated and feared institutions of the East German communist government. Read more about STAZI and watch a Video. So what is the connection between STASI and America? Well…I hope nothing, this is why I asked the question: “Is’ the DeepState/DarkState/or the Shadow Government of the United States, akin to the STASI of the German Democratic Republic?” Now that you have read about STASI, the American DeepState, and have experienced all the illegal spying and data collecting by the American National Security Agency NSA, and the total and absolute distain for the U.S. Constitution by the entire Federal Government including the Judicial. As in Russia, whistle blowers reporting criminal activities of DeepState government agencies must now live in exile or face prison. We are incrementally allowing the destruction of our history and Free Republic. THE BOTTOM LINE: Only you the reader can say what the connection is, if any between America and the Russian Communist STASI of East Germany and what you see as the possible future of the United States. From what I know about the STASI, it was a hundred times worse than the German SS and Nazi Gestapo put together. And looking back at where we’ have come from, and where we are now, and then turning around and looking down the road to the future of the U.S. Government and our Republic…I see STASI my friend, because this government…especially the Congress and the Judicial are totally out of control. Moreover if we don’t return to our Constitutional roots soon, I can guarantee that America will be nothing but a distant memory for a very, very few people. Was (9/11) The DeepState’s Reichstag? Sharia Law Prevails In NYC.